Digital transformation has become a mandate, not just for IT, but across enterprise-wide business processes, including HR, finance, and facilities. The IT organization has a unique opportunity to drive digitization and service transformation throughout the entire organization, overcoming traditional silos with a unified approach. Join VP of Product Marketing, Cherwell Software, Matt Klassen, John Huckle, CEO, Business Forward, and Ryan Mulvaney, Principal Consultant, Business Forward as they share how two global brands are leading the charge with digital/service transformation. The first lesson for implementing ITIL is...never implement ITIL. Rather, focus on the key pain points your organization is experiencing today and “cherry pick” the specific ITIL processes that address these points. Don’t worry about the theory, it is all about the results. Join George Spalding, EVP, Pink Elephant, 20-year ITIL veteran, and co-author of the ITIL v3 Continual Service Improvement volume and Matt Klassen, VP, Product Marketing, Cherwell as they discuss the lessons learned over two decades of working to improve IT performance. Enterprise service management solutions have expanded service thinking beyond IT. Vendor solutions enable organizations to broadly apply service management practices to the rest of the business, uncovering new value and improving service experiences across IT and non-IT business units. Forrester Research recently completed the first comprehensive survey covering 13 major ESM vendors. Join Charles Betz, Principal Analyst with Forrester, for an inside look at the latest Forrester Wave: Enterprise Service Management. Charles Betz is Forrester’s lead DevOps analyst serving infrastructure and operations professionals globally. In this role, he covers continuous deployment and release automation, incident management, and emerging topics such as containers and chaos engineering. He also covers the transformation of “traditional” IT operations organizations into next-generation digital service organizations. He retains an interest in enterprise service management topic areas such as service portfolio management, service catalog, IT asset management, application discovery and dependency mapping, configuration management, and CMDB as well as industry frameworks like ITIL, IT4IT, and COBIT. IT is responsible for supporting the business through daily operations, growth, and change. This hefty responsibility puts IT at the heart of nearly every forward-thinking organization. Unfortunately, there is no single methodology that tells IT exactly what to do, but Integrating best practices that support agility, while also providing stability is the only way to remain competitive. ITIL, the most popular IT best practice framework, raises skepticism when it comes to agility. However, when applied judiciously, strategically, and in the context of agile and lean principles can provide a stable platform while enabling speed and efficiency. New technologies have changed our personal and professional lives for the better. But, accommodating the rapid and dramatic business technology changes can be difficult. Setbacks caused by outdated, legacy ITSM solutions do not make modernization efforts easy. Whether your goals include artificial intelligence, incorporating DevOps, or automating key IT processes, all ITSM teams must embrace change and innovate. Several years ago, IT organizations were focused on quality. But, the financial crisis of 2008 changed that focus to cost. Today, in 2018, IT organizations are forced to find a balance between quality and speed, while also justifying cost. However, complicating this tricky balancing act is the fact that the only constant in IT Service Management is change. Driving this fast pace of change are external forces including cloud, global supply, automation, and competition. Join Senior Product Marketing Manager, Cherwell Software, Chuck Darst, and Troy DuMoulin, VP of Research and Development at Pink Elephant, as they discuss these challenges in what Troy calls the third major industrial revolution. Troy is a leading ITIL® IT Governance and Lean IT authority with a solid and rich background in Executive IT Management consulting. Troy holds the ITIL Expert certifications and has extensive experience in leading IT Service Management (ITSM) programs with a regional and global scope. He is a frequent speaker at IT Management events and is a contributing author to multiple ITSM and Lean IT books, papers and official ITIL publications including ITIL’s Planning To Implement IT Service Management and Continual Service Improvement. 30 years ago ITSM was the “next big thing.” And, in many ways, ITSM has succeeded in changing the IT landscape. Now, ITSM itself must change. The “Digital Transformation” train is an express that doesn’t stop at the ITSM station. 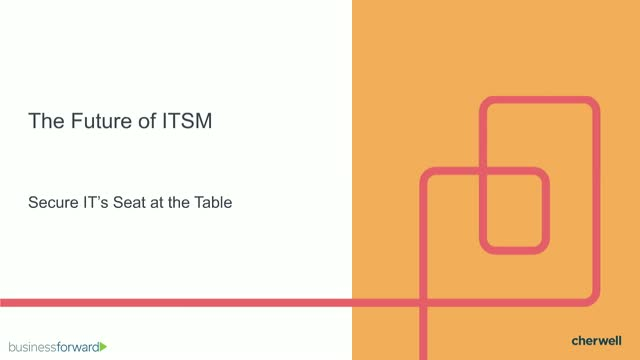 Join George Spalding, Executive Vice President, Pink Elephant and Matt Klassen, VP Product Marketing, Cherwell Software as they discuss the five major areas where IT & ITSM must evolve: Architecture, Change & Release Management, IT Organizational Structure, Infrastructure, and Automation.